The following article is a detailed InstaGC review that provides a closer look at the website, how it works, and the type of rewards it has to offer. In addition, we’ll discuss its pros and cons and touch on any issues that might have come up, as well as lay down their contact information. Also, in this InstaGC review, we’ll focus on some of the most common concerns mentioned by its users. These include problems with customer support and issues receiving points for completed surveys and tasks. By the end of this InstaGC review, you should have all the information you need to decide if it’s a website you want to use or not. InstaGC is what’s known as a GPT, which stands for “Get Paid To” website. In turn, this makes it similar to other survey sites such as Swagbucks or iPoll. On InstaGC, users can complete various tasks such as filling out surveys, watching videos, testing apps, etc. in order to earn rewards. Is InstaGC Legit or a Scam? We consulted dozens of feedbacks from the users for this InstaGC review. In doing so, we’ve come to the conclusion that this website is legit. The site is well-organized, and the company offers in-depth information about how you can receive your rewards. Even more so, there are hundreds of pictures uploaded to the company’s social media pages that offer proof of this. The website is also free to joint, so there’s nothing to lose. Surveys: A common method of earning points on InstaGC is through completing surveys. They have a good number of surveys readily available. However, this method is not always a sure thing as you can get disqualified from taking a survey and only get rewarded a single point. Web Search: InstaGC has a web search function that you can use instead of your usual search engine. This way, you can rack up points on a daily basis. Visit Websites: You can visit the websites of the advertisers on InstaGC. As long as you click and stay on their pages for a few minutes, you can earn some points. Download Offers: You can earn additional points by downloading software. Trial Offers: You can sign up for trials (e.g., trying out a service or product) for a certain amount of time. Through participating, you earn points. Watching Videos: Another method of earning points is by watching videos. Shopping Online: Shop online at participating websites and stack up on points too. 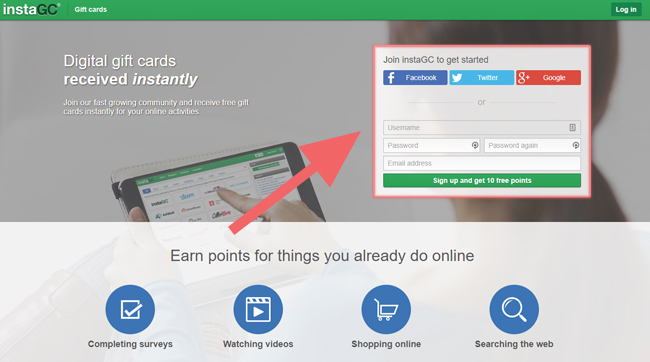 Referral Program: Earn rewards by promoting the InstaGC website and referring friends to join as well. Another major point that this InstaGC review will address is the company’s rewards. This offers a number of different incentives after you saved up a certain amount of points. Information on those rewards can be found in the sections below. Gift Cards: There are more than 300 instant gift cards you can redeem for the points you have allocated. You cannot exchange or get refunds for these gift cards, however. Also, some gift cards may only be available in specific countries or regions. Cash Redemption: You can trade-in the points you’ve earned in exchange for a cash payout. This can be paid via eCheck, direct deposit, or PayPal. Payment Options: InstaGC offers you the choice of cashing out a gift card (300+ available to choose from) or get cash rewards directly. Multiple Ways to Earn Points: You don’t have to focus on just one or two things to accumulate points. There are various methods to choose from. Time Spent to Cash Out: Similar to other similar websites, it can take a good deal of time to acquire enough points to cash out a respectable amount of money. Even then, InstaGC may temporarily lock you out of earning anything more once you reach a certain amount in order to verify your account. Issues getting in touch with customer service. There are several ways you yourself can resolve these issues. You can get in contact with the support team on their website if you’re having issues with the gift cards. Alternatively, you can access one of their social media pages and try reaching out to InstaGC that way for both of the problems mentioned above. In the subsequent section of our InstaGC review, we’ll go into further details about this site’s contact options. Official Website: You can go to the Support page when on the InstaGC website. This is a good way of dealing with gift card or other rewards’ issues. Social Media: If you are struggling with ways to get into contact with InstaGC, you can always look to their social media pages and send messages from there. You can find them on the following sites: Facebook, Twitter, and Reddit. To wrap up this InstaGC review, we conclude that this website seems like an appropriate method of earning rewards. One of its benefits is that said rewards can be either in the form of gift cards or directly cash. There are numerous ways you can earn points, so you aren’t forced to focus on just completing surveys or watching ads, as in some other cases. This survey website does require patience, however, as it’s not a “get rich quick” sort of thing. If you’ve signed up for InstaGC, feel free to comment below and share your thoughts and experiences. If you already have an opinion about it or would like to recommend another survey website, don’t hesitate to do so.